The Hurt Locker, McCullin, Zero Dark Thirty: this week has been all about war and its representation. Each film addresses the impact of war on the individuals that fight them and in the case of McCullin, the devastating burden of memory that comes with bearing witness to the atrocities of combat. 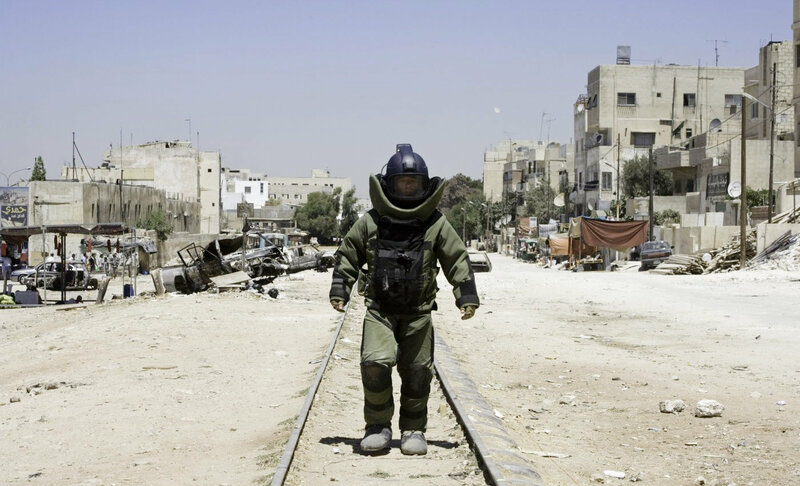 Watching The Hurt Locker again I was surprised by how straightforwardly it makes its argument for war as a drug – the first time I saw it I took this single-mindedness as a sign of focus that serves the tension in the film very well. On second vie wing, there seemed to be moments of narrative emptiness – or at least that the trajectory that central character, James (Jeremy Renner) is on, naturally involves lows as well as highs and that this occasionally results in watching a character that is hard to engage with. This focus pervades Zero Dark Thirty as well, as CIA agent Maya (Jessica Chastain), following 9/11 becomes obsessed with finding and killing Osama bin Laden; at the cost of any friends, family connection or personal relations at all. The screenplay not having included a romantic/parental guilt subplot is not just a welcome relief; it also provides the moral, human critique that many of the films’ detractors have said it lacks, by showing that the efforts of Maya to achieve hers and the governments’ goal don’t solve anything, or justify the war, let alone release Maya from the weight of her obsession. Maya’s emotional numbness; her blank expression on seeing the body of bin Laden represents perhaps a most disturbing judgement of torture that suggests its use has lead to an anticlimactic nothing – a truly chilling notion. Its problematic that screenwriter Mark Boal and director Kathryn Bigelow didn’t choose to emphasise the enormity of the moral outrage and complexity surrounding the use of torture by the CIA, instead portraying it as one method of getting information, that is then replaced by others, such as bribery. However the result is a film that allows for ambiguity – for the viewer to think and engage critically, not just after, but also during the film. Even as Maya is portrayed sympathetically – grieving for the loss of her last ‘friend’ and colleague – she remains somewhat unreachable; unsympathetic; pushing her team to the limits – perceiving that bin Laden’s death will somewhat correct the imbalance caused by the enormous US and UK death toll from terrorist attacks. This distance allows for a viewing that at every turn, can consider what the impact of her actions really are, on her colleagues, the economy, the public perception of the hunt, and most importantly, for the victims of torture. 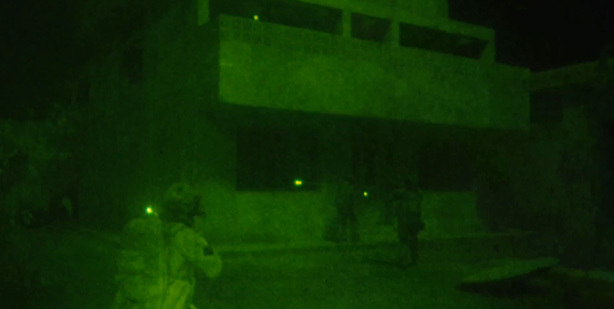 The raid scene itself rewards the procedural approach of the preceding hunt, delivering palpable tension as the SEAL team approach, broach and invade the ‘fortress’ in which their target is concealed. Using an aesthetic most closely akin to video games, and utilising the inherent eeriness of night vision POV, these scenes put the viewer in the midst of the action, following the soldiers as they move up each level – a moment given to dwell on every life taken. 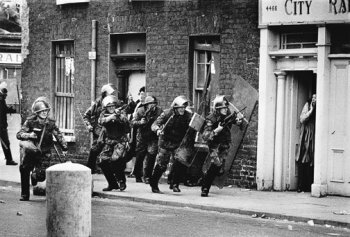 Lives taken feature heavily in McCullin; David and Jacqui Morris’s documentary portrait of war photographer Don McCullin, who, over three decades covered conflicts the world over – Biafra, Vietnam, Northern Ireland, Cambodia – with an unflinching, yet sympathetic eye. Paced steadily, with a solid, if unimaginative chapter-like approach, McCullin traces its subjects’ career, placing the photographs themselves at the heart of each tale of brutality and violence. McCullins’ images, most poignantly described by the man himself – show the humanity that is being lost in times of conflict, or with regard to one devastating account – finding dignity in a place where it would be least expected. Some of the most tragic and heartbreaking moments in McCullin however, are those in which his articulate testimony, without visual representation, conjure a vivid image, allowing the viewer a means to imagine what horrors still haunt the great man. Also watched, in the Filmhouse Polanski season: Cul de Sac – a delight.